There is a month long Birthday Celebration going on the ABNH and we started the fun with Timeless Twine. DT girls totally rocked and I love the twine even more now! Today is my turn on the blog and here are the cards that I made. 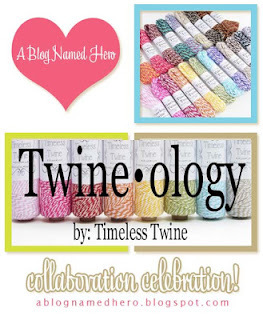 You need to check it out to see the lovely projects from Lucy and Christine and to enter the comment to win some twine fabulous Stacy is giving away. A Blog Named Hero praznuje eno leto in prvi teden sodelujemo s Timeless Twine in vrvicami, ki so mi zelo pri srcu. Potem, ko sem z leti pridno nakopičila cel predal trakov, imam sedaj raje te vesele črtaste vrvice... Joj! Roza sovica in šopek trakcev spetih s sponko. Hvala za obisk in vabljene na ABNH, kjer lahko s komentarjem pridobite en klobčič vrvice. všeč so mi vrvice in tvoje ideja kako jih uporabiti. Hi, Tina! You never cease to amaze me. What a creative way to use the twine. The first card is SO fun & with the perfect background. The second card is simply BEAUTIFUL! I love how you've used the background stamp, the colors are SO lovely, & the design is fabulous! Zelo rada se pridem "guštirat" k tebi :-) Čudoviti voščilnici si ustvarila. oh tina! your cards are so stunning! gorgeous! love the color combo and the designs. you're so talented! 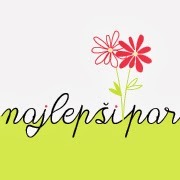 Te vrvice so res tako veselo pisane, da te takoj pritegnejo :) Na prvi si lepo uporabila ostanke vrvic, ki bi jih jaz ponavadi vrgla vstran :) Na tej drugi pa se mi zelo dopade, kako si ta taga povezala skupaj z obema vrvicama. Super cute owl! Love the background that you created for the owl card. And the sentiment and twines on the 2nd card are so lovely! Well done, Tina!